Shell Chemical Appalachia and Eye-bot Aerial Solutions were recognised by Bentley Systems with the Special Recognition Award for Continuous Surveying in Construction at Bentley’s Year in Infrastructure Conference, held in London this week. Shell Chemical Appalachia is constructing a multi-billion dollar, world-scale ethane cracking plant to create polyethylene in the western Pennsylvania region. 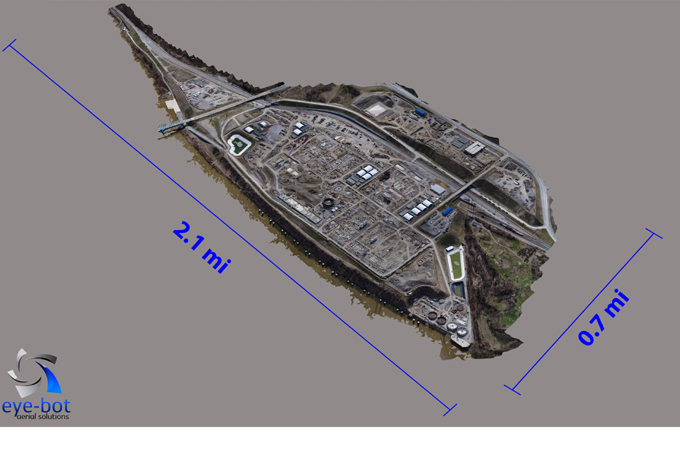 To help monitor and manage construction of the facility, the organisation used unmanned aerial vehicles to capture real-time, accurate data of the entire site and the surrounding areas, close to 450 acres total, and processed the data into a high-resolution orthophoto and 3D reality mesh model. The 3D data provided a strategic perspective of the existing site conditions and served as a single source of truth for both future and retrospective progress analysis, optimising collaboration and decision making between the client and the EPC contractors, with over 500 multidiscipline end users across 10 companies. On a weekly basis, the project team captured more than 8,000 images and processed the images as 2D and 3D deliverables within the required 72-hour window using Bentley’s ContextCapture software. The high-speed processing engines of ContextCapture produced a dimensionally accurate 3D reality mesh, enabling the identification and resolution of potential construction problems before they impact operations on site. The 3D reality mesh models are expected to facilitate inventory control and improve emergency response management.